Hi guys! I have some super exciting news to share, and it may be part of the reason I've reopened my blog! 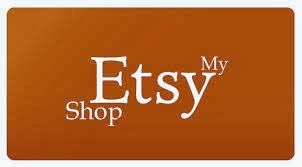 I was recently asked if I would like to become a design team member for one of my all time favourite companies. I am now a member of the Facebook Design Team, for Some Odd Girl! If you love these stamps as much as I do, head on over to the Facebook group, and join in! There are bi-weekly challenges, as well as lots of crafty chatter! 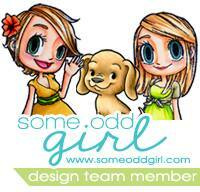 Here is the official announcement on the Some Odd Girl Blog too! Anyway, this weeks challenge on the facebook group is paper piecing, one of my favourite techniques, an oldie but a goodie! 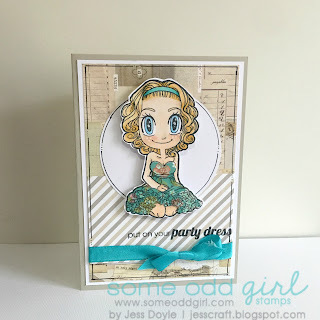 This card features Party Girl Gwen, I've used my copic markers and spectrum noir markers to colour her up, and used some leftover papers to stamp, and fussy cut her dress. I used papers from an old My Minds Eye Christmas paper pad (can you tell it's a Christmas paper?!) And some ribbon to finish this card off. This is very cute. I love how you used the floral print to paper piece her dress. Thanks for playing at CraftyHazelnut's Patterned Paper Challenge. What a sweet card! Thanks for joining us at Die Cuttin' Divas this week. Nicely done! Thank you for joining our “Sketch” Challenge this week at Die Cuttin’ Divas. Oh how pretty!, love that party dress :) Great background paper too! What a very pretty card!! Love that adorable girl image!! Thanks for joining us at DCD this week!